There are lots of different technology teaching tools available to boomers and seniors today, but what's available to you will depend on where you live. Here are some different places and to look for help. There are many communities that offer beginning computer and personal technology classes for older adults that are new to technology. To find out what's available in your area, contact your local public library, senior center, college or university, or local stores that sell computers. Your Area Agency on Aging may also be able to help you - call the Eldercare Locator at 800-677-1116 to get your local number. If you can't find any local programs that meet your needs, here are some national resources that offer technology training in select locations. 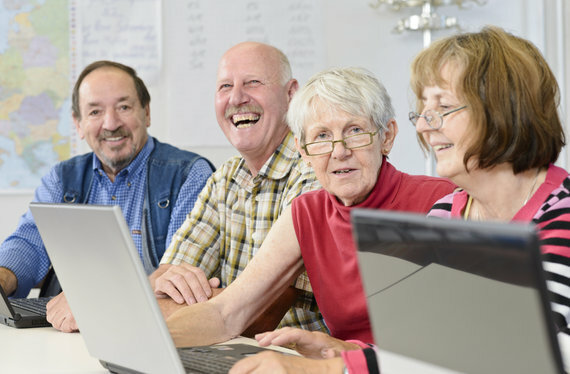 SeniorNet: This organization offers a variety of basic online computer courses as well as instructor-led workshops at 36 learning centers throughout the United States. A first year membership fee of $43 is required. See SeniorNet.org or call 239-275-2202 for more information. Oasis Connections: Provides primarily free computer, Internet and mobile technology classes in 30 U.S. cities. They partner with local libraries, job help centers, senior centers and faith-based organizations where these classes are offered. OasisNet.org/connections, 314-862-2933 ext. 272. Lifelong Learning Institutes (LLIs): Usually affiliated with colleges and universities, LLIs offer a wide array of noncredit courses to retirees, and some may offer technology courses. To find an LLI that offers computer/technology classes, contact your closest colleges or search the websites of the two organizations that support and facilitate them - Osher and Elderhostel. Together they support around 500 LLI programs nationwide. AARP TEK Workshops: Available to everyone, TEK workshops are free technology learning events on tablets or smartphones and are offered in various cities throughout the U.S. AARPTEK.org, 202-434-3021. Older Adults Technology Services (OATS): If you live in New York City, OATS provides free tech training to seniors in 70 locations throughout the city. OATS.org, 718-360-1707. There are also a wide variety of books you can purchase that can help you learn how to use different types of technologies. Visual Steps, for example, offers a number of practical and accessible computer handbooks, software user guides and other instructional materials that are tailored specifically for seniors, as does the "For Dummies" books, which you can buy in book stores nationwide or online at sites like Amazon.com and BarnesandNoble.com. If you already have a computer and some computer and/or Internet skills, but would like to expand your knowledge, there are a number of online services you can turn to that offer a wide variety of self-paced technology lessons and instructional videos. Some good ones to checkout include GCFLearnFree.org, which is supported by the Goodwill Community Foundation and is completely free to use. And MyPCSchool.com, which is privately owned and offers nearly 700 lessons for $39 for three months or $79 for one year. Also check out TechBoomers.com, a free educational website that teaches seniors with basic computer skills about frequently used websites, and Geekatoo.com, which offers tech support house calls in all 50 states, and offers two-hour tutorial instruction for $79.